This is my mums blush and I have worn it a few times and wanted to share my thoughts. Lilicent is a lovely peachy pink colour that is of a muted tone with no glitter or shimmer. Cream blushes are amongst my favourite sort as they avoid the cakey look of what a powder can sometimes give. The formula of this is very creamy and blends easily and gives a gorgeous dewy finish. This colour is very versatile as it will look beautiful on pale and darker skin tones. However, this doesn't have staying power, it just seems to disappear as the clock ticks away. Looks gorgeous. I have never tried a creme blush. I must get on that. Thanks so much for the review! I have been wanting to buy this for quite some time now. Maybe I'll try Illamasqua cream blush instead. Hopefully it will have same/better staying power compared to MAC. I agree completely with your review. So far I haven't had much luck with cream blushes, maybe because my skin is so oily? I do like Stila convertible color though, just have to reapply! 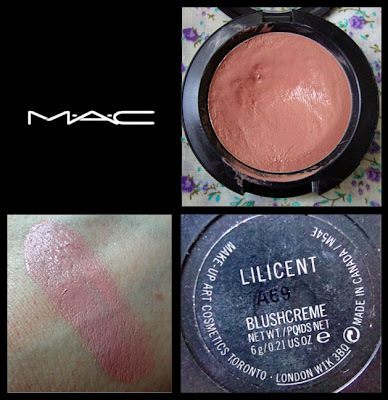 I have one MAC cream blush (Ladyblush) but I like the Illamasqua cream blush and Stila Convertibles better. I like the consistency and the longevity of those products better. @Tahitian11 the illamasqua ones are quite nice, but i dont wear mine that often. I must, so that i can do a proper review on them! @star violet, maybe, but it doesnt last on my mum either and she doesnt have oily skin. @lipstick rules, i must get me a stila convertable! Never tried it! I love love love lilicent but I know what you mean about staying power, I brush very lightly over with a mineral blush of the same colour and it seems to stay put all day. Set with a finely milled translucent powder. It helps it stay on for longer! I surely hope that you can make it work, because it looks like an amazing shade!! !